With Big Money trying to secure restrictive tier access to the internet and the culture of Washington to succumb to these pressures, what can we, The People, do to prevent this from happening effectively? LAWRENCE. HOW DO YOU THINK IT WOULD CHANGE THE WORLD IF THE INTERNET WAS FREE AND EVERY THING IN IT. PERIOD. I AM ALL ABOUT BITING FROM THE KNOWLEDGE TREE, BUT IS THAT A GOOD THING? I can definitely see the benefits of the Free Culture movement to the masses. However, I fail to see how Free Culture can promote innovations and inventions from individuals. The number one motivational factor of major technological breakthroughs has been profit. Without copyright laws to protect them, what motivation would an individual have to release his new-found information or technology to the public? Lawrence, do you think that this free culture movement could impact online music (like P2P sharing)? The librarian at my school, who supervises us on the library computers, thinks that because anyone can edit wiki sites, such as Wikipedia, we should not use these sites for research. I have told her that the administration of these sites checks the info before it is published, but she still thinks that wikis are bad. What do you think? Do you believe that the internet will one day connect all peoples minds into a collective hive of information? 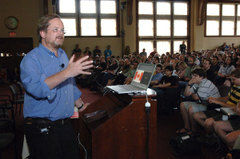 What practical efforts do you take in supporting Free Software movement for which you have recently said is needed for the Free Culture movement? Does Creative Commons as an organization strive to use only Free Software? What about free file formats, considering alot of videos distributed from Creative Commons is licensed under nonfree formats such as MP3 and MOV while there are such good alternatives like OGG (which works for both video and audio)? Correction above: *distributed* not *licensed*. i think its a progressive and positive idea that will do nothing but open oportunity and good sweep societies. we need the freedom to grow and learn. we need truth. at all times! It's too bad the World didn't work out like it Could. Instead its held on our own Back breaking labor. So laws were created to Imitate a Nations morality. Coins were made to set a Value and have lead us in two directions at Once. Love may bring together a Nation but Hate bonds the world. "The number one motivational factor of major technological breakthroughs has been profit." I Disagree. Hackers routinely do amazing things with computers simply for the recognition. Early scientist faced criminal prosecution and even death to bring their ideas to the world. Your view assumes that science has always been chained to the yoke of profit. I believe that science, like so many things, has simply become commoditized. Your view about the world, and assumptions regarding the human spirit, are disturbing and small minded. Are you really arguing that some genius at M.I.T. is trying to develop A.I. or hyperspace propulsion for profit alone? I'd prefer immortality to a fat paycheck any day. I believe these ideas will spur the next great revolution of technological, cultural, and scientific knowledge. Private interests have no claim to what rightfully belongs to the human race. Especially when such private interests are nothing more than social constructs - figments of a lawyer’s imagination. Any belief to the contrary is not only self-destructive, but clearly insane. p.s. - When did the shift happen between private interests bowing to human progress, to human progress being bound by the dictation of private interest? T.C. Craig - To answer your p.s. About the same time when people decided money and power were worth more than personal integrity, after all, with enough money you can make it appear that you are highly moral and social conscious. 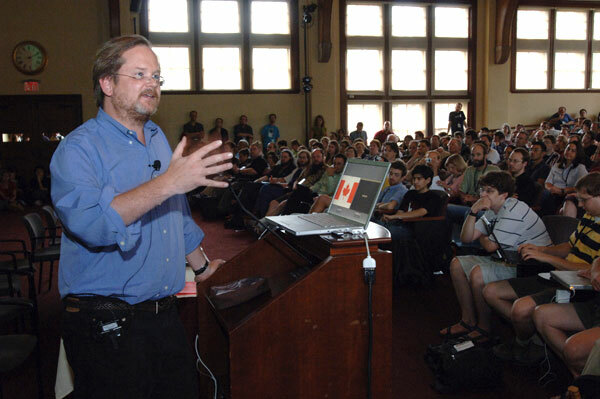 Thank you all for your questions and discussion--Prof. Lessig's responses will be posted soon.